6/11 Cup of Coffee: With Pawtucket and Portland off, the lower minors shined, as the three affiliates went 4-0 on Monday. 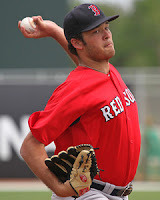 Henry Owens and Cody Kukuk (pictured) each pitched five shutout innings, while Salem's bats exploded early. Thanks to an eight-run first, Salem was able to defeat the Wilmington Blue Rocks (KC), 9-0. Just like the major-league team, the first eight Salem batters reached base as the Red Sox took a commanding lead. That was more than enough for Henry Owens, who allowed only four hits and no runs in his five innings of work. He walked one and struck out five as his ERA dropped to 2.95 on the season. Matty Ott was unhittable in relief, giving up only one baserunner and striking out five in three innings of relief. Keury De La Cruz went 1 for 3 with a double and a walk, Henry Ramos went 2 for 3 with a home run and two walks, and Deven Marrero went 1 for 4 with a walk. Finishing up a suspended game, the Drive beat the Charleston RiverDogs (NYY), 7-3. The game, which started on June 5, resumed in the top of the third with the Drive leading 1-0. Justin Haley was the starter on June 5, and he picked up where he left off, throwing the first five innings on Monday. In all, he threw seven innings and 125 pitches over two days, allowing three runs, while walking four and striking out seven. Jeffrey Wendelken earned the save after throwing two scoreless innings with three strikeouts to end the game. Mookie Betts again led the offense, going 3 for 5 with two doubles and two runs scored. Alex Hassan continued to punish Low A pitching, going 3 for 4 with a double and a walk, and Mario Martinez went 2 for 4 with a home run and a walk. In the second game of the day the Drive stayed hot, as they squeaked by with a 1-0 victory. It was the second straight strong outing for Cody Kukuk, who pitched five shutout innings. He allowed only two hits and walked three, while striking out nine. He now has 17 strikeouts in his last 8 1/3 innings but he also has six walks. Gerardo Olivares recorded his first save by pitching the final two innings of the seven-inning contest. David Chester went 2 for 3 with a double, and the 270-pound first baseman also recorded the first steal of his career. His below-average speed was highlighted earlier in the game when he failed to score from second base on a Martinez double, although he would later score the game's lone run on a Jayson Hernandez ground out. The DSL Red Sox drew 10 walks, as they improved to 6-2 on the season with a 6-3 victory over the DSL Mariners (SEA). Javier Guerra went 0 for 1, but drew four walks and scored two runs. Luis Alexander Basabe went 2 for 4 with a double and a walk, and Franklin Guzman went 3 for 5 with a double. Carlos Garcia pitched well, allowing two runs and striking out seven over five innings to pick up his first win of the season. Carlos Caceres threw two perfect innings of relief. Player of the Day: Mario Martinez was on base five times, while adding a home run and a double to lead the Drive to two victories on Monday. The Drive are 6-3 since Martinez appeared in his first game on May 31, and he is batting .387/.441/.645 in his short time with the club. The 23-year-old is not a serious prospect, but on a Greenville team that was starved for offense, he has been a welcome addition.